1. Multi-radius & complex tube bending. 2. The MR series equipped with multi-tooling can up to 6 tooling levels. 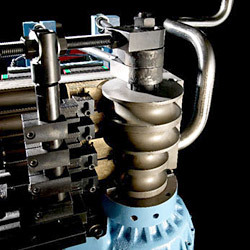 Designed for bending tight radiuses (1 X OD or less) and controlling tube wall thinning, the MR series line serves the most complex and demanding applications for the automotive, hydraulic and boiler industries. 3. The MR series CNC tube benders are equipped with 7 servo-controlled axes, including 6 fully electric servos and 1 hydraulic proportional servo. 4. Material Booster for wall thinning ratio control: wall thinning ratio is <=12% at 1.5D bending (*). 6. Final-Bend material booster mechanism is during the final part of the bending process, the material booster provides an additional "PUSH", allowing every bending to fulfill wall-thinning requirements. 7. Axis Y, B, X may be simultaneously moved and controlled. Axis C, V1, V2 may be simultaneously moved and controlled. 8. Servo controlled transverse movement (X axis) minimizes set up time, removing the need for stopper adjustment when changing tooling stacks. 9. 6 stacks (6 X Radius) bending, with ability to use 3 stacks of compound tooling for short clamping distances and complex bends. 1. CNC tube bender with capacity up to Ø 38.1mm, equipped with 6 electric servos and 1 hydraulic proportional servo. 2. Up to 6 stacks of tooling with material booster. 3. 6 electric servo controlled axes and 1 hydraulic proportional servo axes: (1) Feeding (Y). (2) Planning (B). (3) Transverse movement (X). (4) Bending (C). (5) Pressure die assist (V1). (6) Vertical head movement (V2). (7) Pressure die assist clamping force (hydraulic proportional servo valve).